Central Florida Community Arts is proud to present Ladies and Gents in Concert, the inaugural performance of the organization’s Women’s Chorale and Men’s Chorale. Join us for an eclectic mix of spirituals, hymns, and songs from the Renaissance through contemporary Broadway showstoppers. The Women’s and Men’s Chorale will also join forces to present a beautiful, haunting rendition of the famous ballad, “When I Fall In Love,” arranged by Derric Johnson, creator and arranger of the Voices of Liberty. Guaranteed to be a beautiful night of music, Ladies and Gents in Concert will have something for everyone! 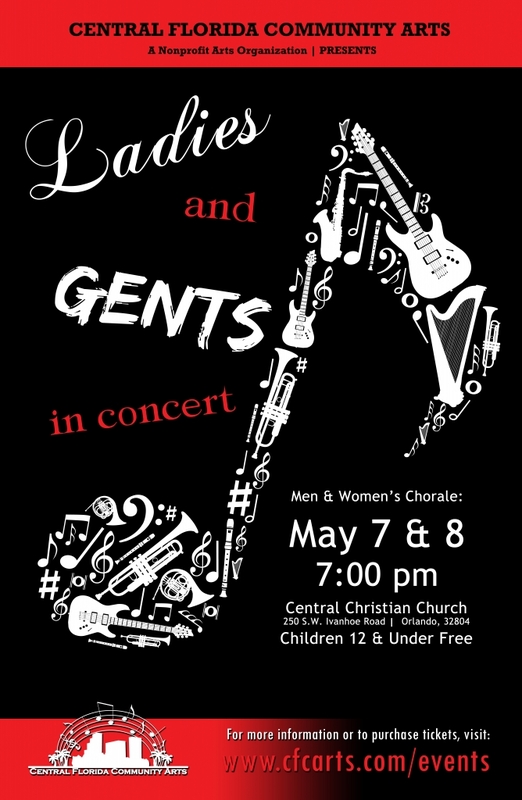 Ladies and Gents in Concert will be performed at CFCArts’ Central Campus, which is on the grounds of Central Christian Church, 250 SW Ivanhoe Blvd., Orlando, 32872., at 7:00pm on Thursday, May 7 and Friday, May 8. General Admission tickets are $10 each, and children age 12 and under will be admitted for free. Please park behind the church, going around the left side of the building, and taking care to turn before I-4 entry ramp, which is next to the church’s driveway.